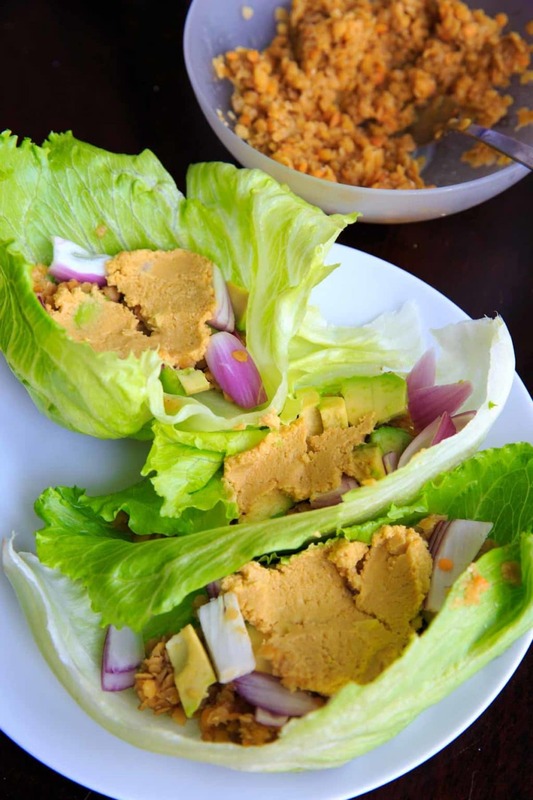 Lentil lettuce wraps with lemon garlic hummus. Healthy, easy, customizable and full of flavor! Vegan and gluten-free. This post is sponsored by Lentils.org in collaboration with their #LoveALentil #LetsLentil campaign. All opinions are my own. Time for another lentil recipe! We already know that lentils are not just for soups. But this time we’re not hiding them. Lentils are the star of the show here! Once again I used split red lentils since they cook in roughly 5 minutes, and mixed in some cumin spice. And there’s your main filler for LETTUCE WRAPS! Do you have memories of getting excited about these at restaurants too? Or am I the only one? Maybe because it’s basically an excuse to play with your food. Instead of just one dish with all the filling mixed together, I like to have an array of bowls with all my options in front of me. My toppings choices consisted of avocado, red onion and a homemade lemon garlic hummus. And the lentils, of course. You can whip up the hummus while the lentils are cooking and have everything ready to eat in 15 minutes flat. 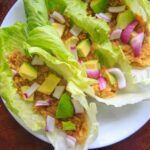 These are filling as a meal in itself, and are packed with protein and fiber. 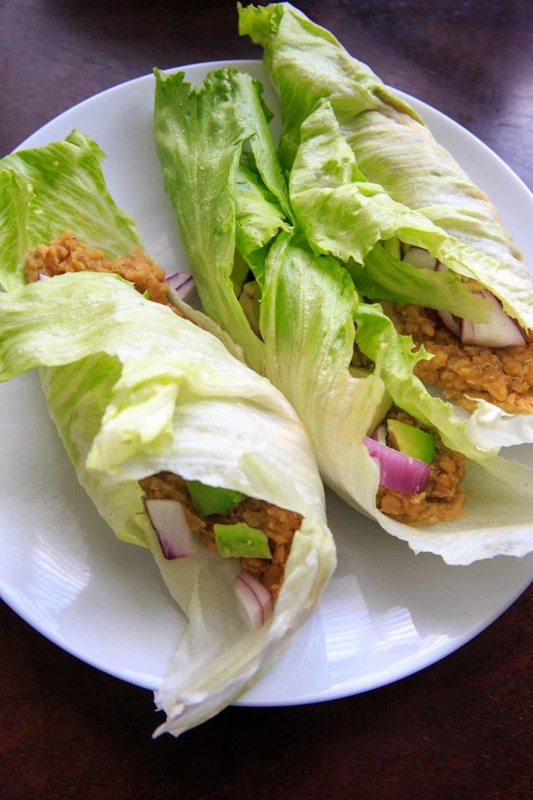 This recipe uses one cup (200 grams) of dried lentils which has a total of 52 grams of protein, divided between 6 wraps. And that’s just the lentils! Everything in this recipe is healthy healthy. 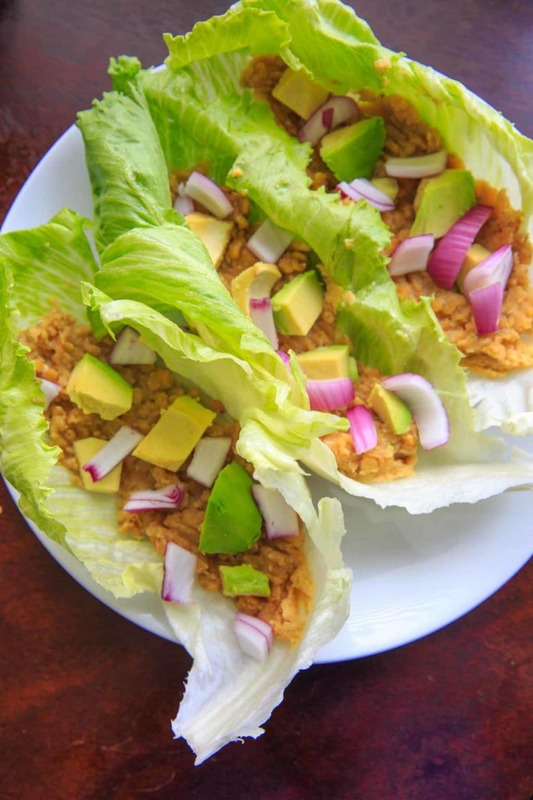 Chickpeas, lemon, garlic, lettuce, onions, avocado. Feel free to get creative with your toppings, but man this combo is good. For the hummus you’ll need a can of chickpeas, a lemon, tahini, olive oil and a couple cloves are garlic. 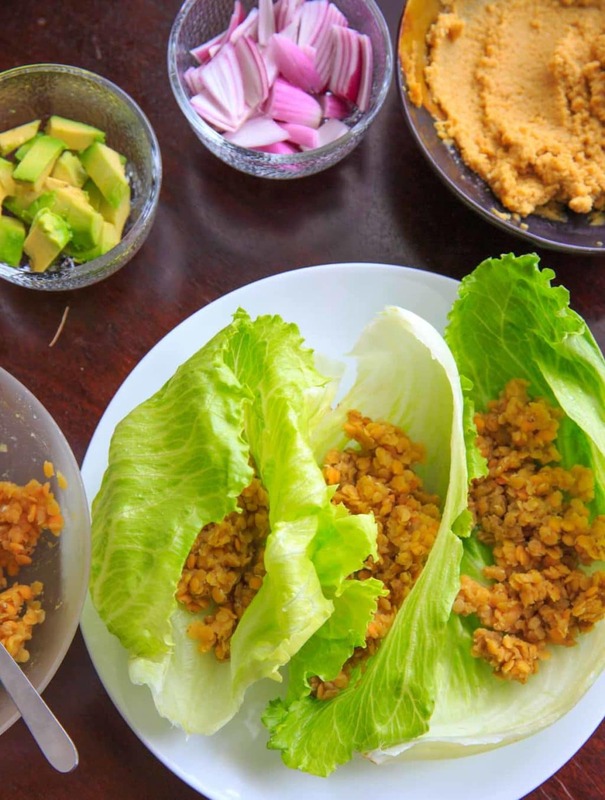 Whip it all up in a food processor and top off your wraps. 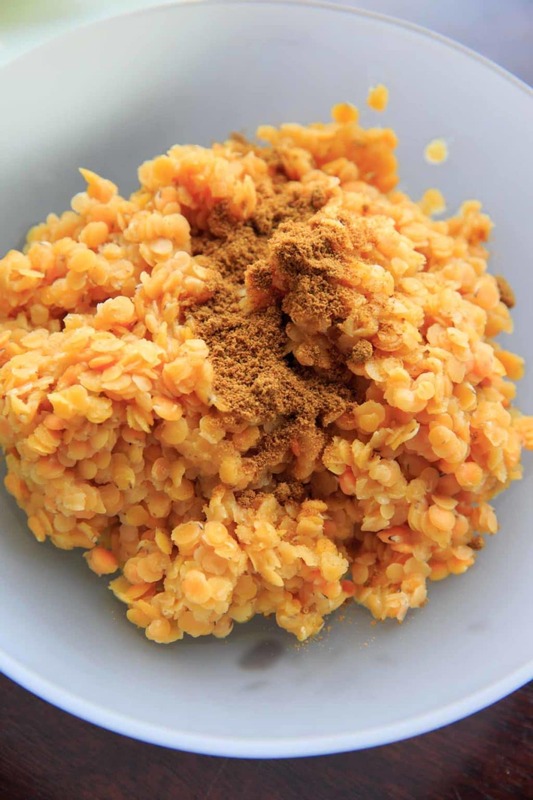 Lemon + garlic go very nicely with red lentils. 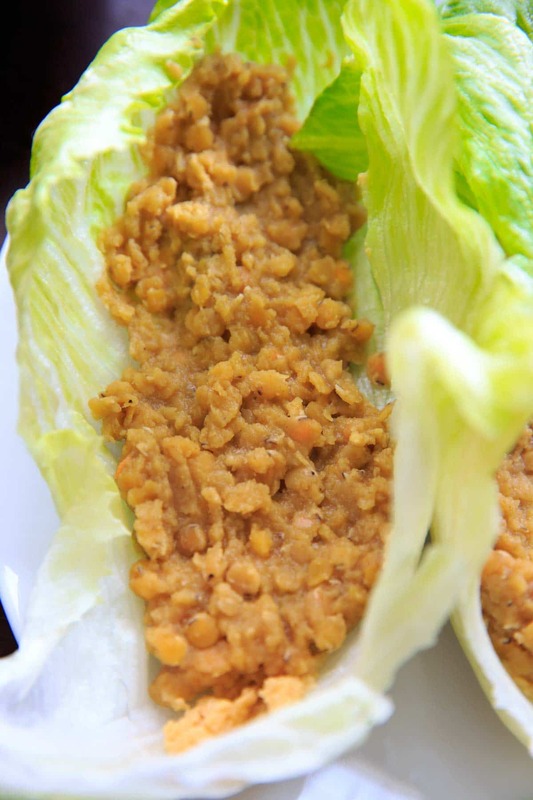 Lentil lettuce wraps with lemon garlic hummus. Healthy, easy, customizable and full of flavor! Rinse dried lentils and add to pot with water. Bring to a boil, then reduce heat to low, cover and let simmer for 5-7 minutes. Remove from heat and drain. Mix together lentils and cumin in a bowl and set aside to let cool. While lentils are cooking, add garbanzo beans, olive oil, tahini, lemon juice, and garlic to a food processor. Pulse to combine. Add salt to taste, and more olive oil or a bit of water if needed. Rinse and pat dry lettuce with paper towels. Add cooled cooked lentils, hummus and toppings as desired. Serve immediately. Enjoy! 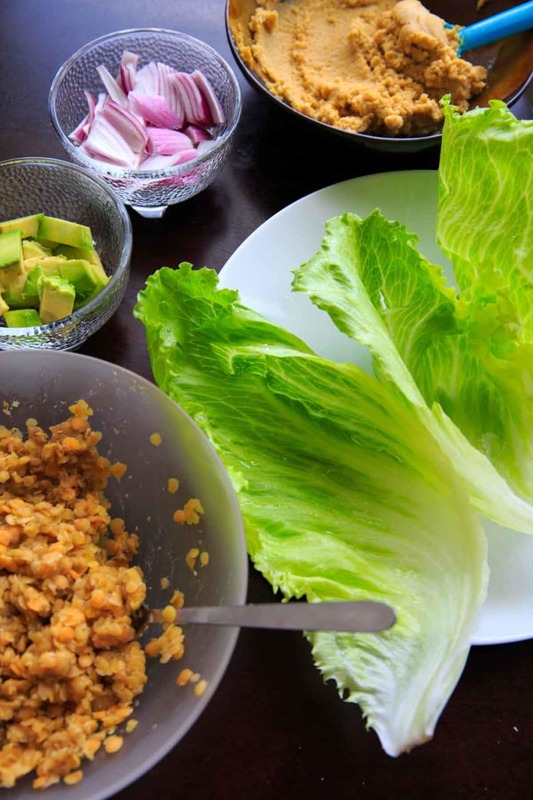 I LOVE lentils and these lettuce wraps sound like a great light summer meal! These are so colorful and healthy! I’m going to give them a try! Thanks for sharing! Looks so healthy and fresh, perfect for the hot season, thanks for the recipe! This would be perfect for a light summer lunch!! Yum! Such a light and refreshing meal. I don’t cook with lentils nearly enough. Would love to try these.